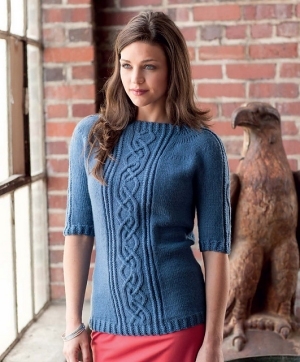 Taken from The Art of Seamless Knitting: "This top is knitted in the round from the bottom up with a Celtic-inspired cable panel along the center front, as well as waist shaping for a flattering silhouette. A complementary cable panel adorns each sleeve, which is also worked in rounds to the underarm. The sleeves and body are joined at the yoke and worked in a single piece to the neck, while the sleeve cables continue into the yoke for an interesting design feature. A portion of the front cable is repeated on the back of the yoke for a tattoo-like surprise." This pattern is from The Art of Seamless Knitting, pg 107 - Cabled Top. Size US 6 - 32" circular needles, US 6 double point needles (or size needed to obtain gauge), a cable needle, stitch markers, stitch holders, and a tapestry needle are required but not included. Finished Bust Measurements: 35.75 (41.5, 44.5, 50.25, 53.25, 59)" after blocking. Gauge: 22 sts and 32 rows over 4". $89.55 -- Kit price including yarn only (no book or pattern). $99.50 -- Kit price including yarn only (no book or pattern). $109.45 -- Kit price including yarn only (no book or pattern). $119.40 -- Kit price including yarn only (no book or pattern). $129.35 -- Kit price including yarn only (no book or pattern). $139.30 -- Kit price including yarn only (no book or pattern).